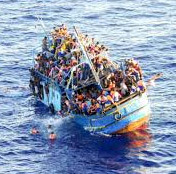 This year 350,000 migrants have already arrived in Europe by sea, over 2,600 have drowned in the Mediterranean, and the flow of refugees shows no sign of reducing. While the EU has recently stepped up its inadequate rescue operations at sea, no coordinated effort to ensure the right to seek asylum has been reached, and individual members’ policies differ profoundly. French and German requests for each country to take a mandatory number of migrants have been refused, and the EU’s ‘Dublin Regulation’placing responsibility for examining asylum seekers’ claims with the first EU country that a migrant reaches, has proved unworkable. Greece (the arrival point for Syrian and Afghani refugees) and Italy (the arrival point for Africans, predominantly Eritreans), are unable to cope. Don Flynn is the Director and founder of the Migrants Rights Network, a board member of the UK Race and Europe Network (UKREN), and chairs the Platform for International Cooperation on Undocumented Migrants (PICUM). He will discuss this humanitarian catastrophe with us.